Among VCs and entrepreneurs like myself, there’s a lot of talk about the recent pivot from consumer startups to enterprise software. It seems that many young founders have now decided they’d rather start the next Box, not the next Facebook. The shift to enterprise is a bit of the “tail wagging the dog.” The poor short-term performance of a few consumer IPOs like Groupon and Facebook coincided with the strong performance of software as a service IPOs such as LinkedIn, Workday and Splunk. Since IPOs have traditionally been the main method for VCs to find liquidity, these investors have shifted their focus. When this happens, entrepreneurs, ever pragmatic, adopt new passions. That's not to say there aren't great things about the enterprise. Three of my favorite attributes of enterprise SaaS businesses are: 1) There is less business model risk; 2) It’s easier to identify pain-points to address relative to ephemeral tools for fighting boredom, and 3) Buyers are usually more rational than consumers – the better product tends to win. 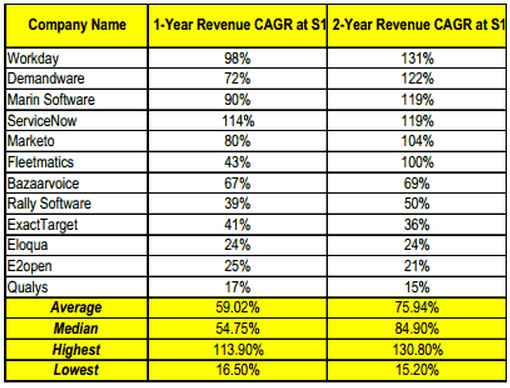 Gartner forecasts that the SaaS market will grow 19.5% through 2016, from $13.5 billion in 2011 to $32.8 billion in 2016. This estimate might be conservative when you consider that Oracle and SAP alone did $58.5 billion in revenue last year, although to be fair both companies are more than SaaS. That said, enterprise businesses are not easy to build. If you’re of the entrepreneurial blog reading crowd, you’re likely familiar with the refrain: “It’s become cheaper to start an enterprise business, but it’s still expensive to scale.” True that. 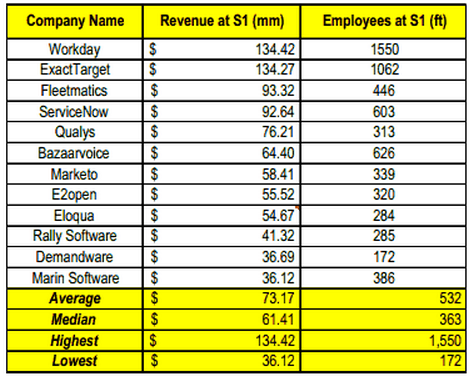 But in an effort to create more actionable advice for budding Marc Benioff’s, I decided to analyze 12 recently IPO’d SaaS businesses to tease out more insights about what it takes to build a big enterprise software business. You can start a successful enterprise business without an IPO but I’m focusing on businesses that have reached an IPO for two reasons: Data availability and the fact that an IPO is still the deus ex machina in people’s minds when they invest in SaaS businesses. For this analysis, I used each company’s first S1 filing, the logic being that’s when everyone first feels that the company is ready for primetime. The business has reached a point where it’s comfortable sharing financials with potential public investors. Here’s what I learned through this exercise. If you start a SaaS business you will not be Kevin Systrom; you will be Sisyphus. Because building a SaaS business takes a lot of time and money. 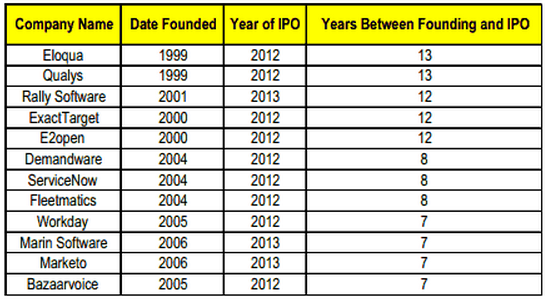 In fact, the average time between founding and IPO was 9.5 years and the median was 8 years. At a minimum you’d have to expect to spend 7 years building your business, though it could take 13 years. The average amount of money raised by these companies was $109 million, with a median amount raised of $74.2 million. The lowest amount, by far, was Bazaarvoice at $19.9 million. The most? More than $300 million. So why does it cost so much to start a SaaS business? Feet on the street. Enterprise software is competitive, so the need to have smart, savvy sales reps delivering insights face-to-face to potential buyers has not gone away. There’s no click-to-buy. You need real live, breathing, resource consuming human beings. As a result, 35% of the total employees at these companies, on average, were in sales and marketing at the time of the S1 filing, with a median of 37.6%. Given the salaries commanded by talented sales reps, this translated into major expenses. As a percentage of revenue, sales and marketing expense was 45% on average, versus 20% for R&D and 15% for G&A respectively. All of the investments in sales and marketing are there to accelerate and get to scale, but what is scale? Or at least enough scale to go public. Based on the companies I looked at, the average revenue for the most recent FY as of the S1 filing was $73 million with a median of $61 million. 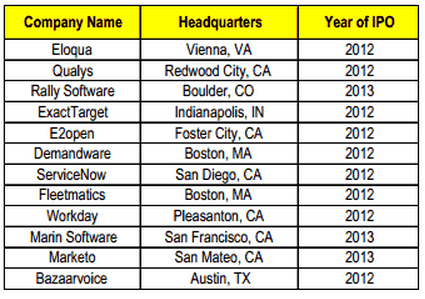 The smallest companies were at $36 million, the largest at $134 million. In terms of employees, the average size was 532 and the median size was 363. Generating the revenue needed to be at scale was not simply a matter of clicking a button to deploy software for these SaaS businesses. A significant portion of their total revenue came from professional services. For the companies that broke out their revenue between “Subscription” and “Professional Services” the average percentage of total revenue derived from professional services was 20%, with a median of 17%. The implication is that SaaS businesses shouldn’t expect to be hands-off. Big companies demand great service, particularly from smaller vendors. For those of you who haven’t read Valuation: Measuring and Managing the Value of Companies between Pacificos in Aruba, the central lesson of the book, and any corporate finance textbook, is that value is driven by cash flow, which springs from return on invested capital (ROIC) and growth. ROIC is simply operating profits adjusted for taxes divided by invested capital. Why does this matter? 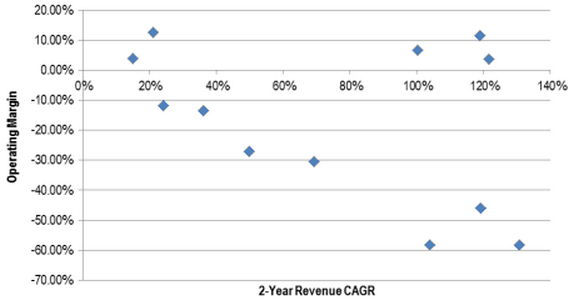 It matters because most SaaS businesses have little or no operating profit as they scale, so they need to grow with a capital “G” to command a good valuation. For the companies analyzed, the average 1-year revenue CAGR as of their S1 filing was 59% and the average 2-year revenue CAGR was 75% (the medians were 55% 1-year CAGR and 85% 2-year CAGR). These growth rates may not feel impressive, but keep in mind this growth is in dollars forked over by skeptical enterprise buyers. Generally the more money these companies lost, the faster they grew. There is of course some causation at play here. As I noted above, a SaaS business requires a lot of money to scale because scaling requires a big sales and marketing team, which is needed to achieve the rapid growth expected in the absence of cash flow, due in large part to sales and marketing costs. 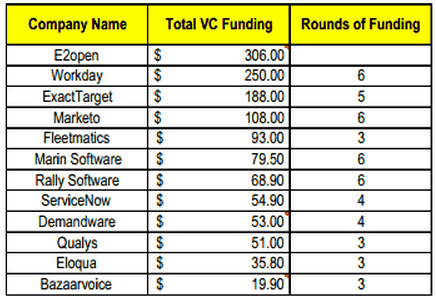 So these businesses are in a constant state of raising capital and scaling the sales team, in addition to building an awesome product and supporting it. This approach is driven by two realities. These companies are pursuing large markets, with a lot of opportunity, and they are competing against behemoths and can’t show up to a gunfight with a knife. So why go through the effort? Because SaaS business are great over the long-term. They yield powerful margins and recurring revenue. 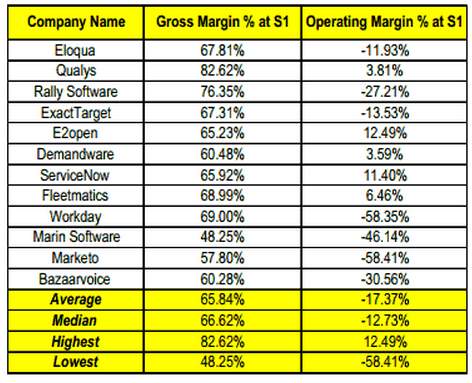 The average gross margin for these companies at their S1 filing date was 65% with a median of 66%. The implication is that once these businesses have scaled, and more revenue is coming from renewals, the 45% of revenue spent on sales and marketing can be reduced. The result is a high margin business with predictability. 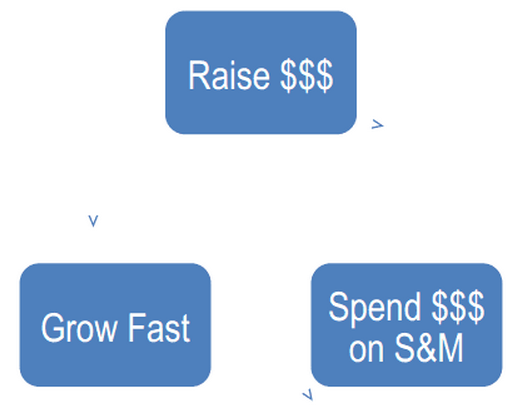 If you just spend 9.5 years raising $110 million dollars across five rounds of funding, and hire 530 employees, including a sales and marketing team of 160 people, while building a world-class product that can win in the hyper-competitive enterprise software business, to reach $70 million in annual revenue, you can create a high margin business with predictability. Sure you don’t want to build a dating app?